The PetSafe Deluxe In-Ground Electric Cat Fence is perfect for keeping your cats safe at home while still allowing them the freedom to roam. Like all PetSafe in-ground fences, this one is reliable and easy to use. The collar is sized way down to suit a cat of any size and offers multiple correction level settings for each collar on the system. The collar is designed to be cat safe with a stretch segment to guard against entanglement or entrapment. Unfortunately, the collar is not rechargeable and uses a PetSafe proprietary disposable battery. SUMMARY: The best electric cat fence out there. The only thing missing is a rechargeable collar! 4 Correction Levels: Each collar on the system may be set to the appropriate correction level setting for the cat using it. The correction levels are lower than a dog fence collar to suit the more sensitive personalities of a cat. Compact & Lightweight: Sized for your cat. The receiver on the collar is the same size as the PetSafe Elite Little Dog collar, so it will not be bulky and uncomfortable on your feline friend. Safety Break Away Strap:Prevents entanglement injuries by allowing the collar to slip off if your cat becomes trapped or entangled. Indoor Pet Barrier Compatible: A nice extra feature for this PetSafe fence system, the PetSafe Cat Fence is compatible with the indoor pet barriers (model: PIRF-100) that allow you to create exclusion zones within your house. Disposable Proprietary Battery: The collar utilizes proprietary RFA-188 PetSafe batteries. They cost about $10 per each battery and they last about 1-2 months. Small Contacts Only: One set of small prongs are included with this system. 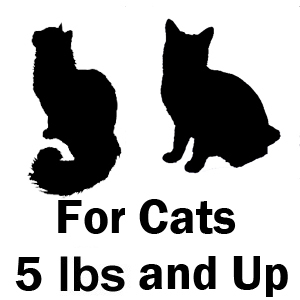 This is typically sufficient for most house cats. Compatible With Other PetSafe Collars: Like the rest of the PetSafe In-Ground Fence Series, this system is compatible with other PetSafe in-ground fence collars including the Elite Little Dog, In-Ground Rechargeable, and the Stubborn Dog collars. This collar compatibility is the way PetSafe makes each of it's fence systems suitable for multi-pet households. Visit our compatibility chart for a complete list of collar compatibility. Adjustable Boundary Width: The boundary width can be set anywhere from 0 to 10 ft. wide. For most installations we suggest a boundary of 3-5 ft. but a narrower boundary can sometimes be used for cats that prefer not to wander and explore. However, if you intend to add an excitable dog or adventurous cat to this fence system, you may want to set a wider boudary correction zone, as this will help prevent daring pets from getting a running start and darting over the correction zone to the other side. Wire Break Alarm: An audible alarm will sound of your system has damage that prevents the signal from traveling all the way around your boundary loop. You can use a wire break locator kit to find the damaged section of wire and then repair it. 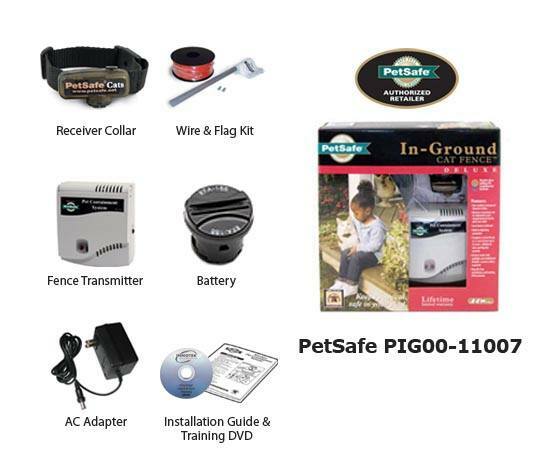 25 Acre Capacity: The PetSafe In-Ground Cat Fence is capable of powering up to 25 acres. The only thing you would need for more than the 1/3 acre coverage this system accommodates, is to add more wire to your package before checking out. You can determine how much wire you need for your acreage with the handy matrix to the right of the "Customize Your Product" section above. 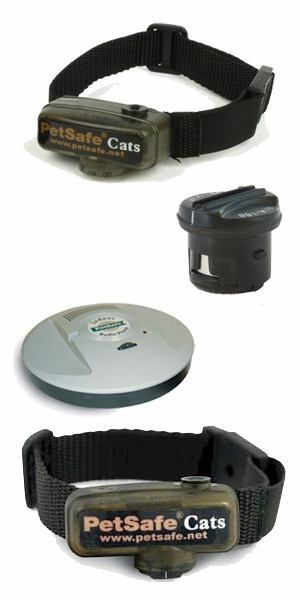 The unique PetSafe In-Ground cat fence works just like an electric dog fence, but uses a smaller, cat safe collar and lower, shorter correction level setting. The collar features independently adjustable correction levels for each cat on the system as well as low battery indicator lights to ensure your cats' constant protection. The PetSafe Cat Fence collar is compatible with other PetSafe In-Ground Systems. Our "indoor" cat is out! I have a chain link fence in my backyard. It worked to keep Sheeba in the yard for a little while. Once she figured out she could jump over it, I was in trouble. My Vet suggested this cat fence to solve my problem. At first, I was very skeptical. I decided to give it a try. Sheeba has been using the fence for several months with no escapes! I am confident that she knows her boundaries. She can use her cat door to go out in the yard anytime she wants. “ I was actually considering buying a dog fence system for my cats. I did not know that anyone made electric fence systems specifically for cats. Then I found out that I could get one from Flex Pets.com. While checking everything out out I notice that this particular cat fence was very well priced and had a lot of different features. It came with an installation DVD and a small fit collar to fit my cats comfortably. It covers a 15 acre area so they have enough room to roam around. It’s a great product and even better since I no longer need to consider a dog fence. I would recommend it for any pet owner looking for a fence."